now people can be greeted with lights and not just on Diwali. If there can be singing birthday cards that operate on battery, cards could be made to blink out the message as well. But these cards would not have mini-batteries embedded between layers of paper to make the trick work. Their elegance would lie in the paper which comes from a species of algae. Albert Mihranyan and colleagues from the department of engineering sciences at the Uppsala University in Sweden ensured that the paper develops the ability to glow. Batteries are mainly composed of metals like lithium, nickel, lead or mercury. Their disadvantages are several. These batteries gradually turn into pollutants; with time their efficiency decreases. The new research, signs into an era of efficient, cheap, recyclable and safe batteries that hardly weighanything. Cellulose from an algal species, Cladophora, was used for this paper. This puts the algae to good use because it is an environmental pollutant otherwise. The cellulose offers 100 times larger surface area than paper derived from wood of trees. The team coated the cellulose with polypyrrole, an organic polymer that conducts electricity. Each cellulose fibre was wetted with a layer of polypyrrole of a thickness of 1/50,000 a strand of human hair. The coated fibres were woven together to obtain thin black sheets of the paper battery. 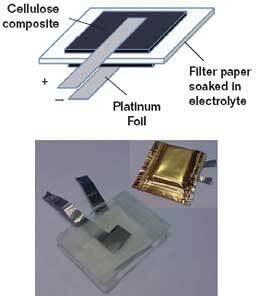 This battery is unique because the same coated paper forms the two electrodes which are separated by a filter paper soaked in sodium chloride solution, the electrolyte. The study in the October 14 issue of Nano Letters said the battery recharged much faster than other rechargeable batteries. These batteries can serve as much larger storage devices some day. It would be possible to scale up the electrodes since the materials are relatively inexpensive, said Leif Nyholm, professor at the University of Sweden and a partner in the study.